The biggest fear for every airsoft player is to be stuck without a charged battery and no way to play. Avoid that disappointment by getting yourself a spare or replacement battery for your airsoft gun. With a huge selection of batteries, chargers and gas, you can be sure you're always powered up and on the field! 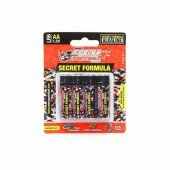 Airsoft Batteries, Chargers and Gas There are 43 products. 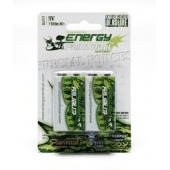 Nunchuck batteries are the most commonly utilized configuration of airsoft batteries. Fitting easily in most crane stocks and some handguards the batteries are the most universal of all configurations. If you are picking up a new airsoft gun this will most likely be the battery style for you. Brick batteries are regularly used in non-collapsible. Due to a variable number of cells configuring into one solid unit brick batteries tend to require more space upon installation. Li-Po Bricks are perfect for external PEQ Box configurations. 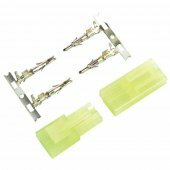 Stick Batteries are regularly mounted at the top of an airsoft gun just above the gear box. Battery cells are packed together in one solid tube or stick allowing for extremely low profile installations. 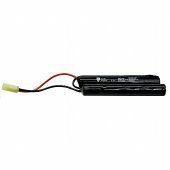 If you are running an AK or UMP styled airsoft gun a Stick Battery is right for you. Note that Li-Po sticks will fit inside buffer tubes, meaning users can run rear wired configurations even if a stock does not contain a battery compartment. Holding an improved charge Nickel Metal Hydride batteries are a cost effective and reliable way to power your airsoft gun. Ni-MH batteries may slowly discharge over time, however they allow users to recharge the unit from a semi-charged state without loss of overall capacity. Although slower to charge than Li-Po batteries a Ni-MH battery offers the safest option on the market resulting in worry free combat all day long. 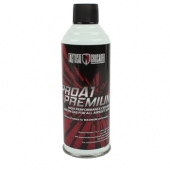 If you are just getting started in airsoft a Ni-MH battery is perfect for you! 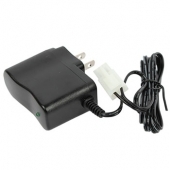 Offering the highest voltage supply Lithium Polymer batteries are a great upgrade for users with advanced airsoft guns. Li-Po batteries allow for the highest charge in the smallest possible package and can be charged at an incredible speed. 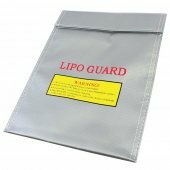 Li-Po batteries have absolutely no memory issues and can be charged from a partially full state without negative effects. 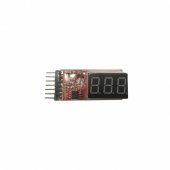 Although dramatically increasing capacity and voltage Li-Po batteries are less durable than NiMH batteries and are prone to failure due to charging issues. Li-Po batteries are an incredible upgrade, however only experienced airsoft players with upgraded airsoft guns should use them. An obsolete design, Nickel Cadmium batteries are no longer used in current airsoft builds. 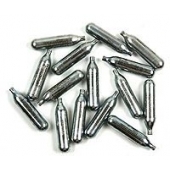 Nickel Cadmium batteries suffer greatly due to the need to discharge the battery completely before recharging. If this isn’t completed correctly a portion of the storage capacity (memory) will be lost during each charge. With the risk of exploding when charged too quickly and a tendency to slowly discharge over time Nickel Cadmium batteries should be avoided at all costs. 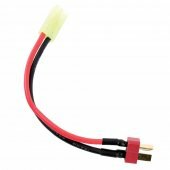 A Tamiya Style connector is the most common design on the market and will be found on most stock wiring configurations. Although Tamiya connectors come in two sizes, small and large, most airsoft guns will require the smaller variant. 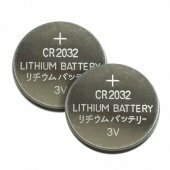 Full stock guns such as the RK47, GR25 and GC7A1 will use large Tamiya plugs so users must be aware of this difference when purchasing a battery. 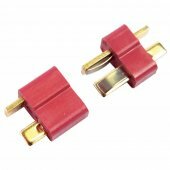 Deans Style connectors offer a spring loaded, flat blade connection providing an increased surface area, less resistance and improved energy transmission. Although offering improved performance a user must modify their gun, battery and charger to allow for compatibility when performing a Deans conversion. A batteries voltage determines the rate at which power is supplied to an airsoft gun. This means the higher a batteries voltage, the higher the rate of fire for that airsoft gun! The easiest way to understand this concept is to equate voltage to an engine in a car. A larger motor allows a car to go faster while increased voltage offers a boost in rate of fire. Keep in mind however that a higher voltage can be tough on the electronics of your airsoft gun. By installing a MOSFET unit this potential damage can be avoided while users to take advantage of improved performance. 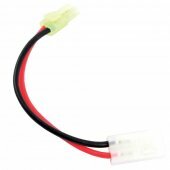 Most airsoft guns do not ship with a MOSFET equipped, therefore a maximum of 9.6V should be utilized. The Milliamp Hour Rating of a battery determines how much power the battery holds. Think of this is like the gas tank of the battery. The larger a batteries tank, the longer it will run without needing to recharge. A larger mAh rating will generally be more expensive, but can really reduce stress at the field. If you don’t want to carry more than one battery to the field be sure to pick a unit with a higher mAh rating!